In the ever-evolving sports landscape, we are beginning to see more leagues willing to adapt with the times, change the old guard, cater to the millennials, if you will. NFL Commissioner Roger Goodell is lightening up on touchdown celebrations, the NHL adopted an increasingly annoying replay system just two years ago. Hell, even the USGA is making changes! Then there is the MLB, widely regarded as our "national pastime," and thus still stuck in the 1960s. But Rob Manfred, commissioner since 2015, is working to change that. A few rules tweaks are already in place, and the latest move involves an ease up on uniform rules. For one weekend in August called Players Weekend, the players will be allowed to put nicknames on the back of their jerseys, XFL-style. They will also be permitted to wear fluorescent-colored shoes and personalize a patch paying tribute to someone instrumental in their development. 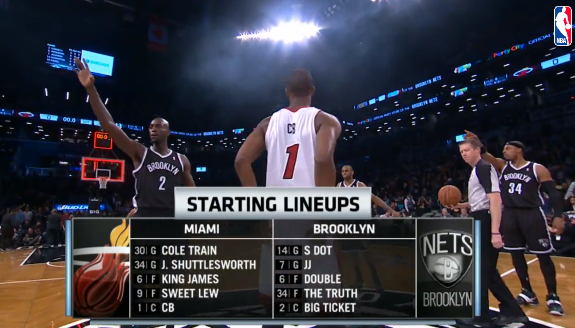 The move is reminiscent of one the NBA tried in 2014, when the league allowed the Miami Heat and Brooklyn Nets to put the nicknames on the back of their jerseys during a game, and it produced these gems. That got us wondering, who will put it to good use in the MLB on Players Weekend (Aug. 25-27)? As of now, there isn't a better and more fitting nickname than Syndergaard's "Thor" in the entire league. The hair, the flame throwing arm, and, above all, the willingness to play the role. The only question is, will Thor be back to don the name on the jersey? The Mets pitcher is still on the mend, and would be sorely missed on the road in Washington that weekend. Who wouldn't want to see Bautista crush a homer at home against the Twins, viciously flip his bat and start a fight while the back of his jersey says "Joey Bats"? I rest my case. If you ask a Red Sox fan right now, they don't want to see the "Kung Fu Panda" on the diamond in any game, let alone a potentially crucial late season game at Fenway against the Orioles. But the Panda moniker is just too good to pass up. Anytime you get nicknamed the King of something (LeBron James, Arnold Palmer), you're doing something right. "King Felix" Hernandez has earned that honor from the second he stepped on the mound as a 19-year-old, and it would look great on the back of his jersey if he gets the start in the Bronx against the Yankees on Players Weekend.